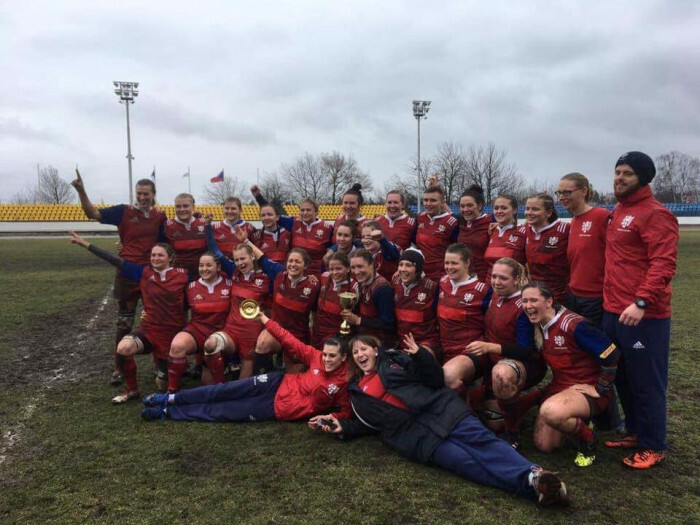 Playing with a style and assurance that belied that position at the bottom of the World Rankings, Czechia followed up their win over Switzerland at the end of last year to win the European Trophy with a 15-0 win over Finland in Prague today. The threat posed by the speed of the Czechs was shown in the opening minute when good run from Daniela Ferugova nearly broke the Finnish line. The speed of the Czech defensive line also put the Finns under constant pressure. After just four minutes Czechia scored their first try. A cross-field run from Katerina Novakova allowed Michaela Svecova to break down the right wing. She was tackled short, but the ball was quickly moved left to Kristyna Plevova who was just able to stretch out and score. Finland initially had some success up front, sending the Czechs into reverse at the first couple of scrums, but even here the Czechs soon found their feet here as well and for most of the match were more than able to hold their heavier opponents, even putting the Finnish scrumhalf under pressure. After the first try Finland had a short period where they pressurised the Czech defence, but found it hard to gain ground. The constant pressure told for Czechia in the 18th minute when they turned over the Finns inside their own 22, the ball was quickly moved left to Katerina Danickova who cut through the Finnish defence before releasing Michaela Svecova for the second try. The heavy conditions tried both side equally, reducing the rest of the first half and much of the second into a war of attrition, with the Czechs generally having the territorial advantage. Further scoring opportunities were few. With only a two-try deficit Finland were always in the game, but throughout most of the second half were stuck in their own half. With time running out on 74 minutes the Czechs finally killed the game. Kristyna Plevova broke away from a now solid Czech scrum 10m from the Finnish line, and passed out to Katerina Koubova who scored in the corner. The game also attracted a record ticketed crowd for a women's game in Czechia - 420.